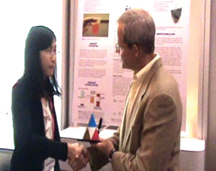 June 20, 2011 - PRLog -- At the Institute of Food Technologists (IFT) Food Expo, Pui Yeu (Rei) Phoon was awarded for winning D.D. Williamson’s Beverage Coloring Competition for Students. Ted Nixon, Chairman and CEO, presented the trophy on Monday, June 13th in a ceremony, after which she answered questions about her novel color application and poster. Ms. Phoon received an expense paid trip to the IFT Annual Meeting in New Orleans. Ms. Phoon is a graduate student in Food Science at Purdue University. Her winning entry was a citrus-flavored beverage fortified with beta-carotene, a bioactive lipid antioxidant that contributes both Vitamin A and coloring. The system used to deliver the beta-carotene is the novelty of the beverage. During the ceremony on Monday, Ms. Phoon acknowledged and thanked her Purdue advisors, Professors San Martin and Narsimhan, for inspiring her to enter the student competition. Phil Nelson, Ph.D. -- Professor Emeritus of Food Science, Purdue University Alumnus and World Food Prize Laureate -- was among the attendees offering congratulations. Ms. Phoon was among students from eleven universities that entered the competition. D.D. Williamson invites IFT Student Association members to submit abstracts in November for the 2011-12 Coloring Competition. The company has expanded the competition to two categories – food and beverage. For details, please visit http://www.naturalcolors.com/studentcompetition.aspx. Color with Confidence -- D.D. Williamson's wide array of natural coloring, along with its sought after caramel color, helps sell 1.5 billion servings of foods and beverages every day. D.D. Williamson improves the allure of foods and beverages through visual appeal. A trusted and recognized provider of color solutions for the food and beverage industry, the company operates nine manufacturing sites on five continents. Visit http://www.ddwilliamson.com for more information.